Mr. Steinar Murud, Secretary General of the Universal Peace Federation - Norway, gave his welcoming remarks, praising the efforts of all the participating leaders, who are making great efforts in their respective fields. World peace cannot be created by any single individual or group, but we all need to work together in order to build sustainable peace. Mr. Mark Brann, Secretary General of UPF Europe, spoke on the importance of the logic of love versus the logic of power, which has been the main way of solving conflicts. But a diplomatic and friendly approach can be just as effective. He illustrated his point by talking about Dr. Moon’s initiatives in Nepal and in North Korea. 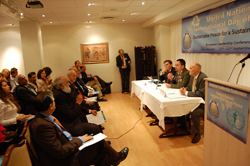 Mark Brann is currently Secretary-General of Universal Peace Federation in Europe based in the United Kingdom. He trained and practised for many years as a lawyer, was Director for Europe, The Middle East and Africa of the international press agency United Press International and is C.E.O. Europe of the international relief agency International Relief and Friendship Foundation. When people of the world are only concerned with their own interest, a common culture of peace is very distant. How can we educate people in global citizenship? This was a youth session with Bogdan Pammer, UPF Youth Europe, as moderator. 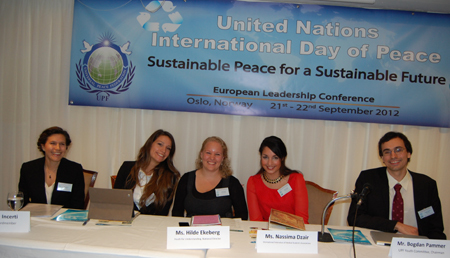 Ms. Hilde Ekeberg, Norwegian Director of Youth for Understanding, Spoke about the value of cultural exchange. Learning to understand each other is one of the fundamentals for sustainable peace. Ms. Nassima Dzair, Director of the international Federation of Medical Students’ Associations, used her own background as an example. She is from an Algerian background, born in Norway, and attended the French school in Oslo. This background made her feel very connected to the theme of being a global citizen. Ms. Sarah Ben-Ammar, a Project Manager from Finland, also with a very international background, spoke about the need of informal education. While the society values formal professional education, we need informal education in order to mature as human beings. Ms. Irene Incerti, board member of Young Dialogue in Norway, and UPF youth representative, spoke on freedom and responsibility. We all value freedom, but to be responsible in all kind of situations is most fundamental to building peaceful relations. Nassima Dzair Medical student from the University of Oslo. She is representing the International Federation of Medical Student’s Association, where she has the role of Liaison Officer to Human Rights and Peace Issuses.